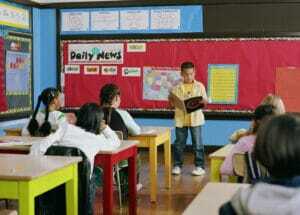 Can young students share oral presentations with confidence? Can little ones provide meaningful peer feedback? The answer to these questions is an enthusiastic YES! This year, in an attempt to expand my first graders’ oral speaking abilities, I introduced a travelling class pet project. Each student was given an opportunity to take Caramel, a large stuffed animal, home for one week. At the end of the week, they were given an additional week to create a picture book explaining the ‘Adventures of Caramel.’ This then became the basis for an oral presentation. To ensure understanding, students were given the job of critiquing my own presentation of Caramel’s adventures with my family. Students were assigned different roles with specific items to assess and provide feedback. One student was given a plastic light bulb and a mini-clipboard with a ‘Caramel’s Adventures’ tally sheet. A second student held a google-eye finger puppet and tallied how many times eye contact was made with them or a friend. A third student wore a headband with two large ears attached; they were responsible for gently cueing me to speak up if they could not hear me. Another student held a Grump on a Stick face puppet that reminded me to smile and be enthusiastic. An additional student held a Smile on a Stick face puppet to remind me to show the right cheeks and not turn my back to the audience. A final student was the prop inspector and tallied how many props I used. Each ‘Feedback Agent’ was reminded that they would be responsible for caring for my heart while giving me helpful feedback at the end of my presentation. Students were informed they must think of at least one positive thing to share before they could share a helpful tip. Typically, I first present a lackluster and quite humorous presentation of what not to do. Through many giggles students shared their caring feedback and I provided comments on how they shared. For example, “Thank you for remembering to tell me one thing I did well before giving me your tip.” This was followed by a ‘redo’ request as I informed the students I was certain I would do much better now that I had had their helpful tips. During subsequent presentations, new ‘Feedback Agents’ were selected. The process was repeated with improved modelling and student feedback. Next, students created a short video highlighting the dos and don’ts of an oral presentation; this was posted on our class webpage for parents to view. Finally, students and parents were provided with rubrics and book templates to complete the assignment. Preparing students in advance, providing students with visuals, and sharing useful ‘Feedback Agents’ tips makes a tremendous difference. It is amazing how students grow in their confidence when presenting orally and providing caring, meaningful feedback! MS (Specialization: Teacher Leadership, K-12), Grade 1 Teacher & Vice Principal at College Park Elementary School, Ontario, Canada. Michelle is passionate about creating a nurturing and dynamic learning environment where children can grow and thrive. In her free time, she enjoys travelling and spending time with her family.